When Brook departed, Ballance was joined by Jonny Tattersall, who smashed 58 from 29 balls to help the hosts post a daunting 379-7. The Foxes never got close in reply, struggling to just 166 from 29.3 overs. 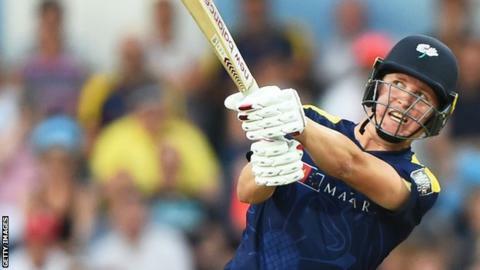 Harry Dearden was bowled by England all-rounder David Willey in the first over for a four-ball duck and the visitors slipped to 37-2 and 118-5. Mark Cosgrove (42) provided some resistance batting at number four. But Mathew Pillans (5-29) ripped through the middle and lower order to secure a thumping win with more than 20 overs remaining. "We didn't start well as a batting unit, but myself and Gary Ballance tried our hardest to build a big partnership and got us to a decent total in the end. And Jonny Tattersall played really nicely at the end. "Then, the bowling was outstanding. We were really ruthless. The pitch did a tiny bit at the start to be fair. There was a bit of seam, although there wasn't much swing. "Getting hundreds is nice. I'm very happy. Hopefully I can go on and get a few more hundreds in this competition and see where we're at in a few games. "It's disappointing after such a great start, having them 17-3. Tommy Taylor was bowling beautifully. Then there was an outstanding partnership from a high-class England player and a potential England player. "They took the game away from us. We lacked wicket-taking options and probably fed them a boundary ball an over. They played smart cricket and executed well. We didn't. "That's something we've spoken about in the team debrief. With the bat, we consistently lost wickets. It's always tough to chase a big score. But we've learnt something straightaway."